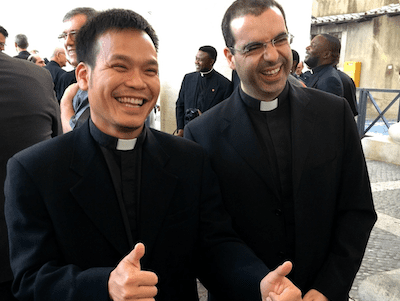 Dehonians USA – The Priests of the Sacred Heart (SCJs) is a Catholic religious community of brothers and priests devoted to the Heart of Jesus. When we accept the abundant love of Jesus and respond to His Sacred Heart with open hearts of our own, we are called to ask: "What more can I do?" There are many ways, through prayer, gifts and action, you can help us share the love of the Sacred Heart. The Priests of the Sacred Heart (SCJ) are priests and brothers called to live, pray and work together, sharing the love of the Sacred Heart in our lives and ministry. Please pray for my brother’s recovery from being neglected in a nursing (well Springs, Las Vegas) He has been left attended by staff, developed septic and went into renal failure. When this was finally realized taken to emergency room where doctors said had they waited any longer he might have died. He has a huge bed sore and so much more because of the neglect of the nursing home. Please pray for my son Craig who is coping with terrible effects of chemo treatments for colon cancer every other Tuesday until April 2019. I ask you to lift my sister Kathleen in prayer as she completes the final stages of her earthly journey after a two year battle with lung cancer. For all of our blessings together, we are grateful. Through the intercession of Father Dehon may her final days be pain-free and joyful. Please remember in prayer my daughter, Bella, who continues to recover from severe injuries from being hit by a car, as well as the staff at Craig Hospital in Denver who are caring for her. Also, keep in prayer the special needs of several others including Gregg, Kevin, Bradley, David, Kylie, Bryce, Matt, Tristan, Nancy, Tori, Lauren, Katie, Art, Eric, Elias, Emily, Matt, Julie, Connor and Maria. God bless and thank you. Let us pray for students, including our seminarians around the world! Prayers for my deceased daughter Diane Hanna & my husband Richard and all my deceased relatives, friends, acquintances, and for all those I don’t know, May Eternal light shine upon them O Lord and may they rest in peace; and for all the souls in purgatory & hell may be able to atone & may God show Mercy on these souls. Amen. Pray for continued healing for persons and their families dealing with addictions. Please help me pray for my private intentions. God bless priests of the sacred heart. Help me pray for my brother Anthony or his intentions and my sister Vivian. Please pray for the conversion and salvation of my family, healing from eye surgery of two friends and healing of baby Michael (newborn) from intestinal surgery. We ask for prayers for our brother, Juan Carlos Castañeda Rojas, SCJ, as he prepares for his ordination to the diaconate tomorrow, June 16. 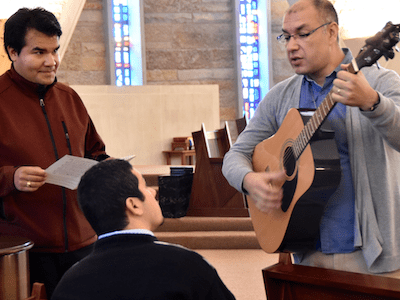 May he feel our support as he enters full-time ministry at Our Lady of Guadalupe in Houston. May God bless him and give him strength. View our online albums of Dehonian events and ministries. Share in our life, share in the stories that we cannot put into words.